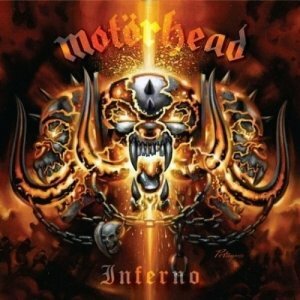 MOTORHEAD - INFERNO VINYL RE-ISSUE (2LP BLACK) | Online Shop | Wizard LTD. Album: "INFERNO VINYL RE-ISSUE (2LP BLACK)"
Inferno is another uncompromising Motorhead statement, featuring twelve catchy new tracks and the band&apos;s typical rock riffs, rousing solos, thundering drum grooves and Lemmy&apos;s hoarse voice. "Most of the material on Inferno was written by Phil and Mikkey. I contributed the lyrics, almost in a fit of panic, and went on to spoil their ideas as well as I could," Lemmy explains with his typically British sense of humour. "That&apos;s how it always works with us. If you know Motorhead, you know what we&apos;re about." Motorhead wrap their unmistakable rock messages in straightforward tracks like &apos;Year Of The Wolf&apos;, &apos;In The Black&apos; or &apos;Keys To The Kingdom&apos;, and Lemmy summarises numbers like &apos;The Killers&apos;, &apos;Suicide&apos; or &apos;Smiling Like A Killer&apos; in a simple statement: "I dealt with the subject of murder from several different perspectives on Inferno." It goes without saying that he does this in his intelligent and frequently cryptic style. Lemmy is famous for his critical lyrics but consciously steers away from political subjects: "A lot of people ask me why I don&apos;t get involved in politics. The answer is: because all politicians are bastards! Whether in America or Europe, I don&apos;t trust any of those idiots. The louder they scream, the more stupid they are. I never write political lyrics, but I do write statements about politicians." On Inferno, Lemmy enlisted the assistance of none other than guitar genius Steve Vai, who proves his extraordinary talent on &apos;Terminal Show&apos; and &apos;Down On Me&apos;. Vai has been a confessed Motorhead aficionado for years and demonstrates that his virtuoso style suits Lemmy & Co. just as perfectly as Slash&apos;s, who, alongside Ozzy Osbourne, put in a guest appearance on March Or Die in the early Nineties. Motorhead also prove that they are able to see beyond the heavy metal genre: even the title of &apos;Whorehouse Blues&apos; documents that the track is about real country blues, remaining typically Motorhead at the same time.